The liberian limited liability company (llc) is an entity designed to provide the limited liability features of a Corporation with the operational flexibility of a Limited Partnership; therefore, it is a preferred form of entity for holding real estate and any other forms of asset investment. The LLC is not a tax payingentity and any profits or losses are reported on the individual member’s tax return. Members of a Liberian LLC have the same limited liability protection afforded to shareholders of a Corporation. In general, a managing member of a Liberian LLC, acting in good faith, will not be held liable to the LLC, to other members, or to third parties for breach of fiduciary duty. The LLC has a separate legal personality, and members are not visible. Members and managers of an LLC are not personally obligated for the debts, obligations and liabilities of the LLC arising in contract or tort. The members are effectively the “owners” of an LLC. 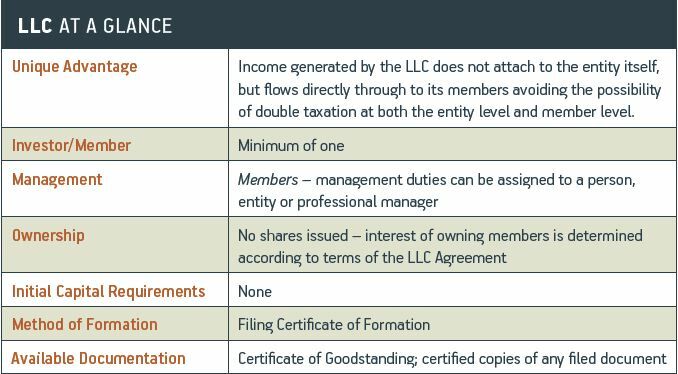 each LLC must have a minimum of one member, and the LLC’s members can appoint professional managers. The LLC Agreement (Operating Agreement) is the LLC’s principal operating document and outlines the respective interests, roles, and rights of its members, as well as statements relating to the intended affairs, conduct, and purpose of the entity. TheLLC Agreement is not filed with the Registry and therefore it is not a matter of public record.